Very satisfied. They had a big job and handled it like pros. They attacked it with verve – Sebastion was our foreman and he was good at lightening the mood whenever challenges arose. He brought in a supervisor to re-estimate the job who was very thorough and specific. I figured the estimate would go up once they saw what they were in for and ultimately the increase was fine and the inventory/approach was very thorough and specific. They worked their butts off all day and did a great job. Excellent. My second time using them, and I will use them again and recommend them to others. Moving is stressful, and it is a relief to have people that care and are helpful. Very satisfied – very hard-working, our move took place on 2 extremely hot days and the air conditioning not working at our move-in location – and they were awesome with everything. Took little to no breaks during the move, declined offers for lunch, just kept working! Wrapped all of our furniture so well, everything arrived in perfect condition, put all furniture back together. The “head guy” was very resourceful, getting tricky furniture to fit in hard spaces and packing the truck to the brim to fit all of our things. I can’t tell you how happy we were with our move. Working with you both before and on the day of the move was great. Very professional, great communication leading up to the move, fair prices, easy, friendly, thoroughness with packing up everything. Found you on yelp which showed great reviews and your quote was the best from everyone we contacted. Lastly you actually returned phone calls and emails which honestly made me feel like you wanted our business (unlike many of your competitors). I was very satisfied with the team that dealt with my move from Alex to the team of three men who moved me. I believe I received the best move service I have ever had. I will recommend Dumbo Moving to anyone and everyone I know who is moving. Thank you for your excellent service. You do not need to improve on anything. You definitely provide the service that you say you do and I would say even better than what you say. You are honest and reliable. I appreciated that I was able to have a lower cost because I was able to move with someone else and both of us benefited. Very happy with all my interactions with DUMBO! I’d happily use them again and recommend them to anyone. I encountered very easy and friendly customer service over the phone, on-time pickup of items from my house to be stored, a good price for three months of storage, and easy and timely re-delivery of the items after our renovation was complete. 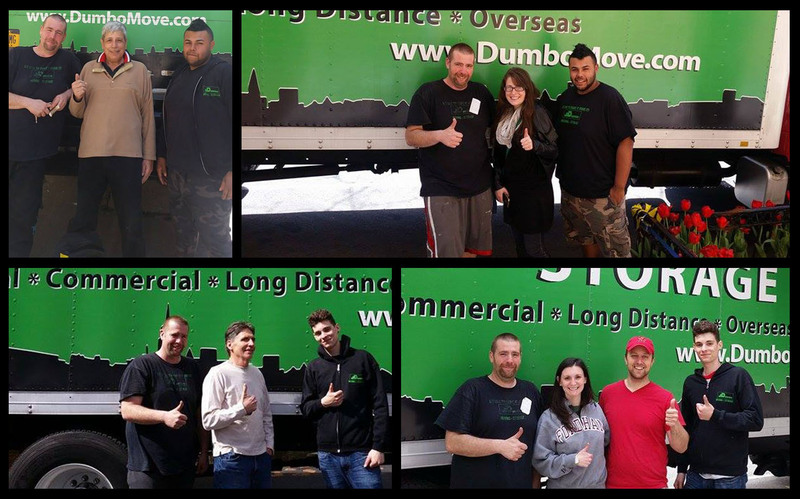 I had an overall fantastic experience both moving and storing with DUMBO – very professional and efficient. My movers were incredibly helpful, responsible and efficient. There were absolutely no problems at all. Dumbo moving company was the best moving company I have ever used. They were extremely helpful, friendly and efficient. I will be using Dumbo for my future moves and recommending them to all my friends and family. I would recommend this company to everyone; the guys worked hard, were friendly, patient, worked as a team and most kept me abreast to all that they were doing. I am extremely pleased with their overall performance… a big thank you!! Leo and his crew were absolutely amazing, I cannot say enough good things about them. They really took the time to make sure that the furniture was properly protected, and took the time to make sure that everything was in the right place and that I was completely satisfied before they left. I am happy to have had such wonderful movers! Very satisfied. They did a great job and did not complain even though they moved me to the top floor of a walkup in very hot weather! Amazing experience. It was so seamless and well done. Your guys were very friendly, and clean.3 different people recommended your company, from a Facebook status I had made. When I found the pricing was by the item, it was even more of a definite choice. I’m very satisfied, especially with the communication. I’m a 5 time repeat customer and for that I make a lot of referrals as well. Easy to use website, great customer service regarding the quote and set up and reasonable price. I am so happy with Dumbo Moving and Storage! You made my move painless and stress free! Thank you! Loved the flat-rate quote. Dumbo also provided COIs without charge in a timely manner – a problem I’ve had with moving companies in the past. The sales representative I worked with was very friendly and not pushy. Very satisfied. Our movers we so friendly and helpful – even helping us with some drilling/assembly when we got to our new home. They were very polite to my new building management – even throughout a somewhat stressful “elevator issue”. I would definitely recommend Dumbo to a friend. They were worth every penny! An easy seamless experience. Would only use this company again for future moves. Made everything easy and stressless. Highly recommended. Amazing service. Our two movers were professional and extremely helpful. They did not complain even after having struggles throughout the move. We also had some extra bags to put in the truck and they did not mind at all. Dumbo moving made my move less painful and the movers were very friendly. They did a walk-through of my apartment to make sure they knew what all had to be moved, and worked quickly and efficiently. I appreciated the communication from the team – they were on time and it was the best move I’ve had so far. I’ve moved with Dumbo several times, and this was probably the best and easiest crew I’ve ever had to work with! (And that’s saying something, since Dumbo movers are really great in general!) They arrived on time, had everything packed up so quickly and efficiently, and even arrived at our new house before we got there! And even the booking for this move was really easy. I got a quote really quickly on the website, and was able to change my list of items before our move date (when I realized we actually had a lot more stuff than I thought). I would highly recommend Dumbo to anyone who is moving. Fantastic. The movers arrived promptly, knew exactly what was expected of them and made the process very painless and stress free! The company was highly recommended by a friend and I will certainly be recommending Dumbo Moving in the future. Amazing. Luca was the best mover i have ever had to date. He made the entire move flawless. I will be requesting him whenever I move. Availability, straightforwardness, organization skills, price. VERY satisfied with the whole moving experience with DUMBO Moving company. The team was wonderful; helpful, kind, nice. The move went smoothly. The guys showed up early. Nothing got broken. They carried furniture up numerous flights of stairs without complaint. They were courteous throughout. Franklin and his team were AMAZING. They came on time and did everything so efficiently. I was amazing how fast they were and how NOTHING got broken. I had used Dumbo before and after the first move went quickly, and efficiently, I decided to use Dumbo again. The second move was equally worthwhile. The movers were so friendly and gentle with my belongings. Plus the price was right! Edward and his team were great. They were careful, hard working, and faced a seriously intimidating move between two walk ups with care, aplomb, and an unfailing great attitude. They deserve three cheers! Don’t loose them. Would recommend your company to anyone asking for a mover! I was very pleased with my overall experience from the quoting process, to customer service, to the actual move. We are very happy with you the way you are. Best moving company we EVER used and we have used ALOT! This was an unbelievable experience from start to finish. I was completely satisfied both with teh customer service and the level of work! Very satisfied; movers were courteous and seemed to know what they were doing. Wonderful! Matija & his crew were amazing.